This 15-minute EP is the first release of Perihelion, but it’s not the first album of the band. Confused? Well, Perihelion is not actually a new band, but the continuation of Hungarian black death metal band Neokhrome under a new name. Neokhrome were formed back in 2001 and released 3 full-length albums, with the last one being “Perihelion” in 2012. They started as a death black metal band, redirecting their sound with each new release, concluding to a much more melodic sound in their last work. On February 2014, the band decided to change its name to Perihelion, a name which according to them “truly reflects the world we create with our music“. 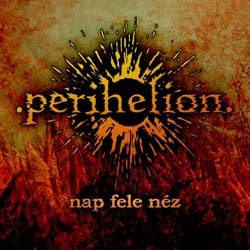 Soon they recorded the EP “Nap Fele Néz” and prepared the video for the same titled song. In the summer of 2014, US labels Black Plague Records and Metallic Media joined forces to re-release the 2012 full-length “Perihelion” on CD under the new band name, including the EP as bonus tracks. Since I have already reviewed ”Perihelion“, this review is focused only on the EP. “Nap Fele Néz” includes 2 new compositions and a cover on VHK’s “Verőfény” and its total duration is a little over 15 minutes. Once again the band has redirected its music. I don’t know if this will be their future style, but what I listen to this EP has significant changes compared to their previous works, especially the early ones. The new songs have a much more epic and at times folkish approach, while the screaming vocals are totally removed. Furthermore all lyrics are now in Hungarian, instead of English that they used in all their previous works so far! The band has done a very good work in guitars, being even more technical and diverse than before, with a very organic sound. Their music is really not easy to describe or categorize. They clearly are not death or black metal anymore, but still their music has a melodic blackened touch in it. Elements of melodic, progressive, epic, folk and post metal are all combined and I really like the result. Vasvári Gyula’s vocals are once again exceptional. His voice is very expressive, emotional and very diverse. He sings only with clean vocals, even if there are some parts that he uses a more “brutal” almost crying style. The cover is a very interesting re-interpretation of a great song by the cult Hungarian band Vágtázó Halottkémek (VHK), that fits perfectly with the band’s new sound. The re-edition of “Perihelion” is out via Black Plague Records and Metallic Media in a jewel-case edition CD with a 4-page booklet, including all the lyrics. It is a very interesting release, especially if you didn’t have the chance to listen to Neokhrome before. The cover artwork is the same as in the first edition and it is illustrated by Hjules. You can listen to their great music by visiting the band’s official profiles, or watching the official video for the song “Nap Fele Néz” below. I am looking forward to listen to Perihelion’s next work and see if they will redefine their sound once more, or if they will try to explore this new path of the EP, expanding their ideas in a full-length.